Are you tired of your pedicurist glaring at you because your feet hurt her hands? Do your dry heels get snagged on your carpet? Sandal season has wrecked your feet and now you are desperately seeking help online and getting mixed answers? If you follow my blog or you follow me on Instagram , you know how obsessed I am with sheet masks and foot treatment masks. Actually, I am just obessed with masks in general. Nothing has changed. I am still the same girl. Karuna has taken the sheet mask game to a whole new level here in the US. They are an accessible brand found at your local Sephora and Ulta. They deliver time and time again. I applied the masks after my evening shower. My feet were clean, odor free and towel dried. I am a makeup artist, so I spend 95% of my day on my feet. I had just worked an all day event and my feeties were killing me. To say I was super stoked to try this new treatment is an understatement. The packaging is beautiful. 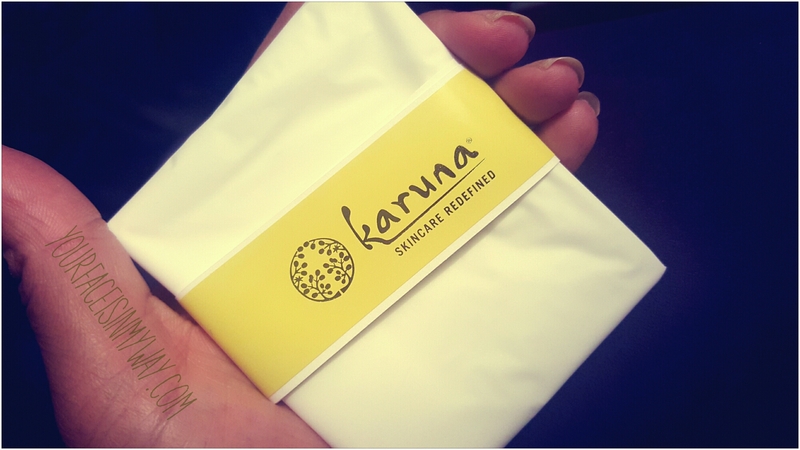 But, all Karuna packaging is beautiful. I vegged out on the couch to watch a few old episodes of “The IT Crowd” on Netflix while my feet were absorbing the luscious treatment. Let’s discuss the size. I wear a size 10. Oh, hush! I’m 5’9″!! It’s fine. These just and I mean JUST fit my foot. I felt kind of constricted as I have larger feet than most, I guess? This is unlike other foot treatment masks that come labeled for sizes 5-9 or a ‘one size fits all’ options. There was no sizing listed on the package. More size options please! I wanted to wiggle my toes around in the foot treatment sock, but there wasn’t any room. I feared my big toe would rip through the white plastic “sock”. This size would work very well for someone up to a women’s size 8.5-9. I want to reiterate the fact that my foot did fit but, it wasn’t a very comfortable fit. My big toes were forced into an almost hammer-toe position. If men would like to try these they would most certainly have to take a pass on them if they wear a size larger than a men’s 7-7.5. My feet were pretty dry to begin with. I live next to the beach and walk in the sand and salt water almost daily. They were in desperate need of the botanical and exfoliating formula. As always, Karuna keeps it real and Paraben Free. Astringent properties of Tea Tree are an added benefit to this treatment (sweaty, stinky feet? Karuna’s got your back!). These do have fragrance in them. It isn’t overbearing at all. Smells fresh and spa-like. Is that a thing, something smelling “spa-like” or did I just make that up? Upon removal of the masks, my feet felt slightly sticky from the serum inside of the mask. I rubbed it in and let my feet completely air dry. I went to bed. The next morning my feet felt so SO soft and hydrated. Like, how? They felt like sand paper the night before! Karuna, you did good here. I’m not sure about how “exfoliated” my feet were BUT, they were soft and smooth. I believe the exfoliation here is more of a micro exfoliation, so you won’t see the skin peeling off. The skin on the tops of my feet seem to have a bit of a glow. A little brighter if I do say so myself. After my morning shower my feet were still in this silky luminous state. PERFECT! My feet held onto moisture and stayed super silky for a week after. After a second treatment a week later my feet were brand new! Calluses don’t live here anymore. At times I found myself sitting on the couch rubbing my silky smooth feet. This was a new thing for me as I typically only touch my feet to clean them. Because ew. Feet. I think I will still continue to use my industrial strength peels for when calluses build up. 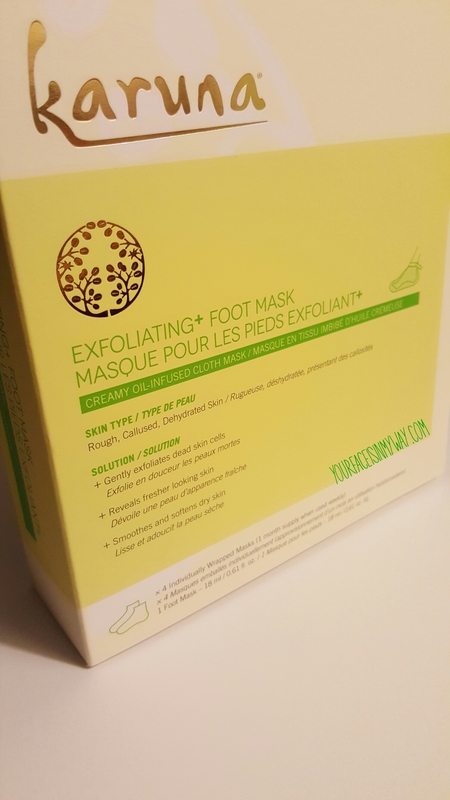 I will definitely use the Karuna Exfoliating+ Foot Mask for when my peeling process from the industrial strength peel has ceased. I am positive the Karuna masks will help maintain the smoothness I get from the aforementioned masks. Overall I give these foot masks a 9/10. That is only because of the size. Make them a bit larger or offer size options and it would be an easy 10/10. You can follow Karunaskin here on Instagram. 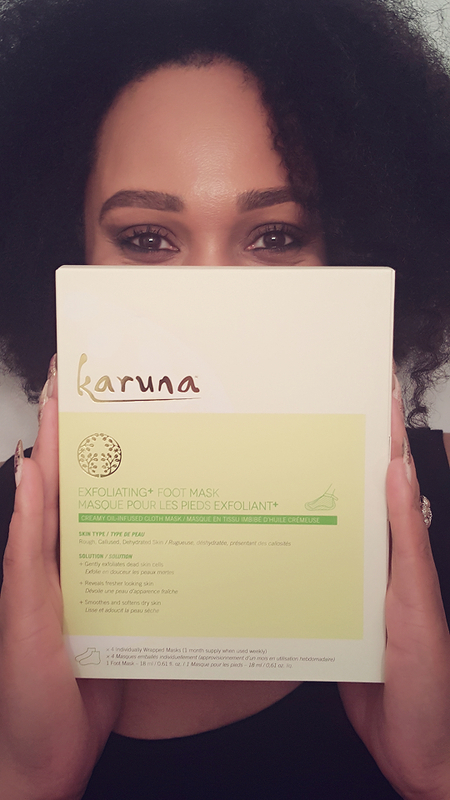 As of 9/26 you can purchase the Exfoliating+ Foot Masks, 4 treatments per box for $38 on the Karuna Skin website.